The Nuclear Nonproliferation Treaty: Fin de Regime? Why the landmark accord is in trouble and what can be done to bolster it. For almost 50 years, the nuclear Nonproliferation Treaty (NPT) has provided the foundation of the global security order. It had bound its 191 states-parties in a joint enterprise to curtail nuclear proliferation and to promote nuclear disarmament. Today, this enterprise is in mortal peril. An enormous fissure has opened regarding the right course of action to realize the treaty’s disarmament objectives. Two-thirds of its adherents are opting for a new process to produce a treaty to prohibit nuclear weapons while the minority faction of nuclear-weapon states and their allies are shunning this process. An existential threat to the NPT has emerged that will require dedicated remedial action if the treaty is to mark its golden anniversary at its next review conference in 2020. The origins of the current crisis can be traced back to an extraordinary meeting of NPT states-parties in 1995. The NPT entered into effect in 1970 with an initial term of 25 years. Every five years, the states-parties to the treaty meet in a review conference to consider the functioning of the treaty and to make decisions regarding it. 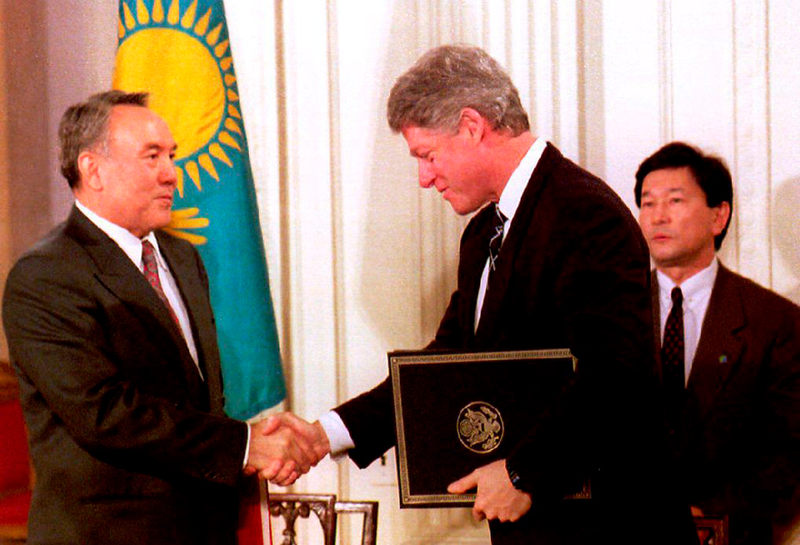 The 1995 review conference had the additional crucial task: deciding whether the treaty should be extended indefinitely or for another fixed period. At the time, a strong current for an indefinite extension was evident in the lead-up to the conference, but it would require some delicate negotiations to make this outcome unanimous. The resulting package included the indefinite extension alongside decisions on “Principles and Objectives,” a strengthened review process, and a resolution calling for the establishment of a zone free of weapons of mass destruction (WMD) in the Middle East. In recalling the importance of this interlinked package for the successful outcome, Jayantha Dhanapala, the president of the conference, has stated his conviction that “without this political foundation—which at the last minute of the conference was extended to include the Middle East resolution—the states-parties would never have been able to agree to the indefinite extension without a vote.”1 The failure to implement this package over the subsequent 20 years is a primary driver of the current crisis of confidence for the NPT. The “grand bargain” concluded with some fanfare at the 1995 NPT Review and Extension Conference almost immediately ran into implementation problems. Decision 2 adopted at the conference, titled “Principles and Objectives for Nuclear Non-Proliferation and Disarmament,” had set out key priorities in terms of future multilateral agreements needed to underpin the NPT. First among these was the conclusion of the Comprehensive Test Ban Treaty (CTBT) prohibiting all nuclear tests. The CTBT was concluded shortly after the review conference and opened for signature in the fall of 1996. Despite wide support, the treaty has never entered into force due to the failure of eight states specified in a treaty annex to sign and ratify the agreement. Second was the negotiation of a treaty banning the production of fissile material for nuclear weapons, known as the fissile material cutoff treaty (FMCT). The 1995 review conference called for the immediate commencement of negotiations on an FMCT in the Conference on Disarmament (CD), the 65-member body in Geneva designated by the United Nations as its negotiating forum for arms control and disarmament agreements. These high-priority negotiations for an FMCT have never been initiated, and the CD has been in a state of total paralysis for more than two decades due to clashing priorities in a consensus-bound forum unable to agree on a program of work, let alone commence one. The “strengthened” review process did not result in the fuller scrutiny of the implementation record of states-parties or the generation of substantive recommendations for consideration by the review conference. The four annual preparatory committee meetings of each five-year review cycle have shied away from generating substantive proposals. These meetings have been content with taking a few, basic procedural steps and have put off any decisions on substance to the review conferences themselves. The 1995 Middle East resolution, with its goal of a WMD-free zone involving all the states of the region, has failed to show any progress. A commitment made at the 2010 review conference to convene by 2012 a conference on the subject failed to be realized. As this failure continued into subsequent years, many viewed the entire endeavor as constituting yet another “nil” result in the NPT’s performance report. The one element of the 1995 package that has endured is the indefinite extension of the treaty, that is, the commitment of its parties to adhere permanently to its provisions. Some of these parties are beginning to question whether a crucial element of leverage to ensure compliance with treaty commitments was lost when the NPT was given an indefinite extension rather than a time-limited one. This buyer’s remorse for the landslide movement in 1995 to extend the NPT indefinitely reflects a wider perception that the so-called grand bargain embodied in the treaty itself is not respected in an equitable manner. That bargain consisted of a tripartite commitment on the part of non-nuclear-weapon states to forswear the acquisition or development of nuclear weapons, on the part of the five nuclear-weapon states under the treaty to pursue nuclear disarmament, and for all parties to support the peaceful uses of nuclear energy. These underlying provisions have come under increasing stress in recent years to the point where the treaty’s continued authority is being called into question. Since the turn of the millennium, these stresses have been reflected in a disconcertingly unstable pattern of achieving consensus outcomes at successive review conferences. The 2000 and the 2010 conferences concluded with substantive outcomes, but the 2005 and 2015 conferences failed to produce any such results. The first preparatory committee meeting of the current NPT review cycle gets underway in May, and it may prove fateful for the treaty’s future. Four key factors have combined to undermine the NPT and compromise the solidarity of its members: (1) the failure of the nuclear-weapon states to fulfill their disarmament commitments, (2) the inability to effect universalization of the treaty and resolve its major regional security threats, (3) the absence of crucial institutional support for the NPT, and (4) the erosion of the “common purpose” that had animated NPT parties around its core nuclear nonproliferation norm. After examining each of these factors, this essay will conclude with suggestions for remedial action. In the eyes of the non-nuclear-weapon states, progress on nuclear disarmament has been woefully inadequate and has essentially ground to a halt in the current period. Efforts by successive NPT review conferences to provide objective benchmarks to measure progress on nuclear disarmament, notably the 13 “practical steps” endorsed in 2000 or the “22 Action Items” agreed in 2010, have not resulted in greater results or transparency by the nuclear-weapon states. The accumulated frustration over the failure of the designated multilateral body, the CD, to produce anything for 20 years has led to a concerted pushback by the majority of non-nuclear-weapon states. After years of being passive spectators at the equivalent of a Waiting for Godot play about nuclear disarmament, these states have finally awoken from their stupor to demand alternatives to the moribund CD. The initial evidence of this call for a new approach came with a series of three conferences held in 2013 and 2014 and hosted by Norway, Mexico, and Austria, respectively. The common theme of the gatherings was the catastrophic humanitarian impact of nuclear weapons use. They served to remind the international community of the devastating threat represented by existing nuclear arsenals and of the complete unavailability of an adequate humanitarian response to any detonation of a nuclear weapon. That reality undergirds the view that the only sure way to eliminate the existential risk is to eliminate the weapons. 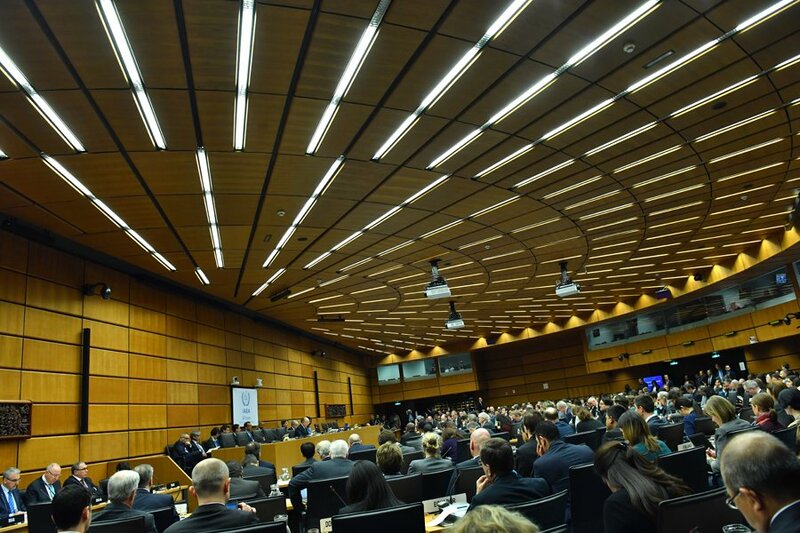 The conferences, which involved ever greater numbers of states as well as civil society groups, introduced a new and potent discourse of morality into the drier strategic language that had dominated NPT sessions. 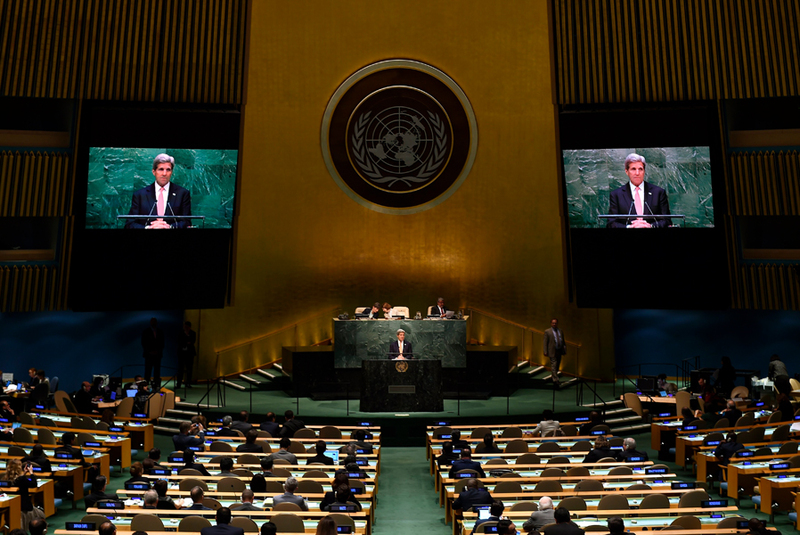 The humanitarian initiative conferences were given diplomatic expression by the adoption of a resolution at the 2015 session of the UN General Assembly calling for states to work “to fill the legal gap for the prohibition and elimination of nuclear weapons.”3 The resolution focused on a long-standing contradiction in the international security framework, that the NPT had not subjected nuclear weapons to a comprehensive prohibition akin to that applied to the other weapons of mass destruction: biological and chemical. The resolution implied that this de facto exemption for nuclear weapons was invalid and should be terminated. The non-nuclear-weapon-state proponents of the “Humanitarian Pledge” resolution supplemented it with another in December 2015 that set out a process to revitalize the UN disarmament machinery.4 The resolution established an open-ended working group to meet for three sessions during 2016 and report to that fall’s General Assembly. In pointed contrast to the CD’s strict consensus procedures, the working group was created under UN General Assembly rules that allowed for voting. Partly because of this break from the straitjacket of consensus, the five nuclear-weapon states of the NPT and the four non-NPT nuclear-armed states (India, Israel, North Korea, and Pakistan) decided to boycott the entire working group process. This was a rather extreme tactic to employ on the part of the nuclear-armed states, given that it not only deprived them of a voice in the proceedings, but also represented a blatant act of disrespect toward a duly constituted multilateral process representing the vast majority of NPT states. The working group reported on its findings in August 2016, with its chief recommendation being for the General Assembly to commence in 2017 negotiations on a legally binding instrument to prohibit nuclear weapons, leading toward their elimination.5 This recommendation was made effective through a new version of the December 2015 resolution at the 2016 General Assembly session, which was adopted by a vote of 113-35 with 13 abstentions.6 Of the nine nuclear-weapon-possessing states, five (France, India, Russia, the United Kingdom, and the United States) voted against, three abstained (China, Israel, and Pakistan) and one supported (North Korea). Among the negative votes were all the non-nuclear-weapon member states of NATO except the Netherlands and several others sheltered under the U.S. nuclear umbrella, notably Australia, Japan, and South Korea. Regardless of the debating points and diplomatic jousting that occupied much of 2016, a new reality will be present in the multilateral disarmament arena as of March 2017. Pursuant to the resolution, four weeks of an open-ended multilateral process will commence with the aim of negotiating a treaty prohibiting nuclear weapons. The NPT has never been able to deliver such a multilateral negotiation on nuclear weapons, and now a large group of non-nuclear-weapon states has essentially bypassed its cumbersome consensus-bound procedures. In a further repudiation of the traditional processes as represented by the CD and NPT review conferences, the new negotiation is to be conducted under UN General Assembly rules of procedure that do not require consensus decisions. A new source of energy has appeared in the multilateral disarmament realm, one that enjoys considerable support from the majority of NPT states-parties and many in civil society. Although it is too early to foresee the results of this negotiation, there is no question it will shake up the NPT establishment and pose a severe challenge to its credibility and authority. If it is to survive, the NPT will have to overcome the current rejectionist front of the nuclear-weapon states and their allies and develop a positive agenda for nuclear disarmament in general and the ban negotiations in particular. The appearance of the ban treaty negotiation is not the only serious challenge to the NPT’s standing. The inability to bring into the fold the four nuclear-armed states remaining outside the treaty (India, Israel, North Korea, and Pakistan) has cast a shadow over the NPT project, especially given the active nuclear weapons buildup undertaken by three of these states. Despite years of lip service to the goal of universalization of the NPT, the reality is that little has been done by states-parties in that direction. In fact, what has been done by influential nuclear-weapon states, notably with respect to India, has been in the opposite direction. The series of nuclear cooperation agreements concluded between India and leading nuclear-weapon states, starting with the U.S.-Indian deal in 2005, essentially provided India with the benefits of NPT membership without its obligations and thus removed whatever motivation there might have been for it to adhere to the treaty. The regional and global security threats represented by the heated nuclear rivalry between India and Pakistan, not to mention the unchecked nuclear weapons drive of North Korea, have not been abated by the existence of the NPT or through the efforts of its leading states-parties. An underappreciated problem with the NPT is its institutional deficit. As an early international security agreement, it was not provided with the range of support mechanisms now considered standard for multilateral arms control and disarmament accords. Between the review conferences once every five years, the NPT lacks an institutional persona. There is no standing bureau or executive council to provide continuity and oversight, no empowered annual meetings of states-parties, and no secretariat or dedicated implementing organization. The International Atomic Energy Agency (IAEA) has important tasks pursuant to the nonproliferation commitments set out in Article III of the NPT, but there is no agency with responsibility to oversee compliance in general. The treaty lacks any provision for the convening of an emergency meeting of the states-parties to respond to developments that may threaten the treaty’s authority. North Korea’s 2003 withdrawal from the treaty clearly was detrimental to the interests of all parties, but there was no NPT mechanism to give expression to this. Members had to wait three years before the UN Security Council adopted a resolution on the matter. Probably the most important political impact of the humanitarian initiative and its culmination in the ban negotiations is how it has shattered the consensus around the NPT as the framework for global nuclear nonproliferation and disarmament. For almost half a century, the NPT and the political directions generated at its review conferences have provided the blueprint for the international community’s efforts in the nuclear field. The step-by-step approach to nuclear disarmament advocated by the leading nuclear-weapon states and echoed by their retinue of allies was not seriously challenged. The existence of a legal “gap” in the treaty was neither acknowledged nor figured in any of the action plans generated by review conferences. With the adoption of the Humanitarian Pledge and the authorization of the ban negotiations, a major schism has opened up within the NPT community. A two-thirds majority of its states-parties have now endorsed a competing agenda to the nuclear orthodoxy of the past that sets its sights on the mere possession of nuclear weapons as unacceptable and supports the negotiation of a legal instrument prohibiting them. This stance by the majority of non-nuclear-weapon states is correctly viewed as being incompatible with the policy of nuclear deterrence, with its threatened use of nuclear weapons under certain circumstances. The ban camp also has effectively challenged the relevance of the usual diplomatic menu endorsed at successive review conferences. The ritualized calls for early entry into force of the CTBT, for the immediate commencement of negotiations on an FMCT in the CD, and for the further reduction of nuclear forces and the role of nuclear weapons in security doctrines will seem increasingly hollow against a background of an actual multilateral negotiation for a treaty prohibiting nuclear weapons. Following the initial one-week session of the negotiations in late March, what will be the mood among the representatives of the NPT states-parties when they convene in May in Vienna for the first Preparatory Committee meeting leading up to the 2020 review conference? Will there still be a sufficient sense of a common purpose to motivate the delegates and encourage cooperation? Some may argue that the NPT’s nonproliferation pillar will provide sufficient purpose to maintain solidarity. Certainly, the conclusion of the nuclear deal with Iran, although not done under NPT auspices, has helped to reinforce the treaty’s nonproliferation commitment. Disarmament, however, has long been recognized as the opposite side of the nonproliferation coin, the treaty requiring progress on both if it is to retain its authority. If the nuclear-weapon states are not able to go beyond the threadbare rhetorical commitments to nuclear disarmament during this review cycle, the rift among the NPT membership is likely to become unbridgeable, with serious consequences for the treaty’s viability going forward. This year may prove to be decisive for the future of the NPT. It is difficult to see how sufficient common purpose can be sustained now that a major rift has opened over the realization of the NPT’s nuclear disarmament aims. A two-track approach whereby a majority of non-nuclear-weapon states participate in the ban negotiations while the nuclear-weapon states and their allies boycott the process and continue to support the moribund step-by-step approach will not be a credible option for even the near term. The treaty parties will end up espousing two contradictory positions on nuclear disarmament and, in so doing, undermine a core pillar of the NPT. States-parties may conclude that their security interests are no longer served by the constraints of the NPT and seek to exit the regime de jure via withdrawal or de facto by ceasing to comply with its provisions. Either way, the impact on international security could be seriously destabilizing, with some non-nuclear-weapon states even reconsidering their nuclear abstinence and nuclear-weapon states faced with an unstable and uncertain nuclear landscape. Avoiding this damaging scenario will require a concerted effort to restore a modicum of solidarity and common purpose within the NPT community. The following are proposals for corrective action. 1. The nuclear-weapon states must overcome their annoyance and rejection of a “not invented here” process that challenges their positions. With their allies in tow, these states should abandon the boycott tactics they have employed against the ban negotiations and agree to participate in this process mandated by the UN General Assembly. The nuclear-weapon states and dissenting non-nuclear-weapon states would be free to promote their views on the “premature” nature of a prohibition treaty and to enumerate the various conditions they consider necessary for a new multilateral agreement to advance toward the goal of a “world without nuclear weapons” that they have endorsed. There is no deadline to the ban negotiations, and if and when an agreement emerges, states will remain free to accept or reject it. The mere fact of having a multilateral disarmament negotiation underway will inject new life into moribund bodies. 2. The nuclear-weapon states and their partners should strive to demonstrate the utility of the step-by-step approach to disarmament by actually bringing one of these steps to a productive conclusion. The ripest in this regard would be the initiation of negotiation on a fissile material production ban. This would be an admittedly challenging undertaking, but it could be authorized by a General Assembly resolution, thus circumventing blockage at the CD. More study of the fissile material ban problem is not warranted; the time has come to launch a negotiation process. Such action would at least parallel a nuclear weapons ban negotiation with a negotiation of a relevant and long-standing agreed goal. 3. Nuclear disarmament action needs to be revitalized in order to restore credibility to this dimension of the NPT bargain. There are many ways that the nuclear-weapon states can accomplish this individually and collectively. Unilateral reductions of nuclear forces could be undertaken along the lines of the presidential initiatives of the early 1990s and dubious elements of modernization programs could be shelved, such as U.S. development of a new, nuclear-capable long-range standoff (LRSO) cruise missile. The United States and Russia bear a special responsibility to demonstrate that the disarmament motor is not stuck in neutral or slipping into reverse. Resuming bilateral strategic reduction negotiations, including an extension of the 2010 New Strategic Arms Reduction Treaty (New START), without preconditions should be a political priority. Taking some proportion of U.S. and Russian intercontinental ballistic missiles off high-alert status would be another reassuring measure. Finally, the nascent consultative process among the five permanent members of the UN Security Council, which are the five nuclear-weapon states recognized in the NPT, needs to progress beyond the production of joint lexicons to engage in substantive projects aimed at facilitating equitable reductions of nuclear forces. Chinese and U.S. leadership in ratifying the CTBT to demonstrate the commitment of the five permanent members of the Security Council to this treaty would also represent a major confidence-building measure. 4. Verification has long been recognized as an essential complement to nuclear arms control and disarmament. The launch by the Obama administration of the International Partnership on Nuclear Disarmament Verification was an important initiative in practical terms and as a political signal. This multilateral effort needs to be strengthened and rendered more transparent. The reality is that “not a single nuclear weapon has ever been dismantled under procedures internationally agreed and verified.”11 Imagine what might be achieved if even a small fraction of the $400 billion price tag for modernization of U.S. nuclear forces over the next 10 years was devoted to developing the procedures and technologies required to verify nuclear disarmament. 5. The nuclear-weapon states should assume leadership of a renewed effort at providing institutional support to the NPT. In cooperation with like-minded non-nuclear-weapon states, they should champion a package of reform measures that would provide the NPT with empowered annual meetings, some form of executive oversight and continuity between review conferences, and an implementation support unit. Such a reform exercise would constitute a public vote of confidence in the NPT and equip the treaty with practical support mechanisms. 6. Transparency is essential for accountability. The nuclear-weapon states, building on modest initial steps, should embrace an annual reporting requirement based on a common format to provide details of their actions in fulfillment of treaty obligations. All states should be encouraged to produce reports on implementation, but it is vital for the credibility of the NPT process that the nuclear-weapon states furnish their fellow states-parties with accurate and comparable data on their progress in realizing treaty commitments. A concerted effort on the part of concerned states-parties to revitalize the NPT as a potent force for progress on the global nuclear agenda is needed at this juncture. Part of the justification for initiating the humanitarian initiative and ban movement was the perception that the NPT has failed to deliver on one of its key objectives and had become an encrusted and rusty piece of diplomatic machinery. Reinvigorating the NPT will require a major change of policy and practice on the part of its leading states-parties. If this rescue effort is not mounted, there is a serious risk that the treaty will start to hemorrhage its authority and support. Global nuclear governance and international security would suffer greatly as a result. 1. Jayantha Dhanapala and Randy Rydell, “Multilateral Diplomacy and the NPT: An Insider’s Account,” UN Institute for Disarmament Research, UNIDIR/2005/3, 2005, p. 50. 2. For a discussion of this point, see Paul Meyer, “Hard and Soft Linkages Between Nuclear and Conventional Disarmament,” in Rethinking General and Complete Disarmament in the Twenty-First Century, UNODA Occasional Paper, No. 28 (October 2016). 3. UN General Assembly, “Humanitarian Pledge for the Prohibition and Elimination of Nuclear Weapons,” A/RES/70/48, December 7, 2015. 4. UN General Assembly, “Taking Forward Multilateral Nuclear Disarmament Negotiations,” A/RES/70/33, December 7, 2015. 5. UN General Assembly, “Taking Forward Multilateral Nuclear Disarmament Negotiations: Note by the Secretary-General,” A/71/371, August 2016 (containing “Report of the Open-Ended Working Group Taking Forward Multilateral Nuclear Disarmament Negotiations”). 6. UN General Assembly, “Taking Forward Multilateral Nuclear Disarmament Negotiations,” A/RES/71/258, December 23, 2016. 7. NATO, “United States Non-Paper: ‘Defense Impacts of Potential United Nations General Assembly Nuclear Weapons Ban Treaty’: Note by the Secretary,” AC/333-N(2016)0029 (INV), October 17, 2016, annex 2, http://www.icanw.org/wp-content/uploads/2016/10/NATO_OCT2016.pdf. 8. Beatrice Fihn “The Logic of Banning Nuclear Weapons,” Survival, Vol. 59, No. 1 (February-March 2017): 48. 9. Canada was the initiator of a reform plan in the lead up to the 2005 and 2010 review conferences that sought to fill some of the institutional gaps via proposals for a standing bureau, empowered annual meetings, and a treaty support unit (secretariat). The proposal received some cross-regional support but was not included in the consensus section of the review conference outcome document. See 2005 Review Conference of the Parties to the Treaty on the Non-Proliferation of Nuclear Weapons, “Achieving Permanence With Accountability: Working Paper Submitted by Canada,” NPT/CONF.2005/WP.39, May 17, 2005; Preparatory Committee for the 2010 Review Conference of the Parties to the Treaty on the Non-Proliferation of Nuclear Weapons, “Strengthening the Review Process of the Treaty on the Non-Proliferation of Nuclear Weapons: Working Paper Submitted by Canada,” NPT/CONF.2010/PC.III/WP.8, April 15, 2009. 10. Robert Einhorn, “The NPT Review Process: The Need for a More Productive Approach,” Arms Control Today, September 2016. 11. Edward Ifft, “A Challenge to Nuclear Deterrence,” Arms Control Today, March 2017, p. 12. Paul Meyer is a retired Canadian diplomat who served as ambassador and permanent representative to the United Nations and the Conference on Disarmament in Geneva from 2003 to 2007. He is an adjunct professor of international studies and fellow in international security at Simon Fraser University and a senior fellow at The Simons Foundation. Read more about The Nuclear Nonproliferation Treaty: Fin de Regime?